Widespread adoption and increasing numbers of implementation have opened a huge global market for biometric devices and applications. As more and more implementations take place, demand of parts, hardware, software and services is set to increase. Meeting this demand would require mass production of hardware and spares for biometric equipment, efficient supply chain and implementation of service delivery network. Growing demand of biometric systems offers an enormous opportunity for businesses and professionals. To leverage this opportunity, bigger organizations are likely to engage in biometric business. As bigger players come forward, which are well capitalized and have ability to make large investments, price war is expected to intensify, which will eventually increase the completion and benefit customers. Adoption of biometric systems and rise of biometric as a service has beginning to create a biometric ecosystem, consisting of integrated identification and authentication services. Mobile biometrics is also playing a role in the overall growth of biometrics. As more and more affordable smartphones and tablets come equipped with fingerprint or other biometric hardware, service providers will incline towards biometric authentication for their smartphones applications. According to a report from Counterpoint Research, mobile biometric is expected to witness a huge rise as more than 1 billion smartphones are anticipated to ship in the year 2018. Devices with fingerprint sensor will attract more service providers to integrate fingerprint authentication for customers trying to access their services. The rise of mobile biometrics is expected to boost entire biometric ecosystems and will benefit the consumers and the industry alike. While consumers will get friction-less authentication experience, service providers will be able to provide biometric security with the offered services. Biometric devices and applications have marked its presence in government organizations, private outfits and institutional setups across the globe. It has become a primary identification method for civil application in many developed as well as developing countries. Biometrics is extensively being used in high security physical as well as logical access. High security military area, nuclear reactors, weapon development facilities, etc. are using biometrics to safeguard the facility and keep intruders away. It is also being used in border control, where identity of people, seeking entry in a country, are verified against what is on record, and unknown people are identified with automated biometric recognition. Biometric devices and applications seem to taking over the world by storm, however, in terms of market penetration, they are still their infancy. The global biometric market is expected to grow from USD 10.60 billion in 2016 and estimated to reach USD 41.39 billion by 2025, at 17.06% CAGR during 2017-2025. Prices are very likely to go down further due to competitiveness and economy of scale. Biometrics is a technology that can be implemented across different industries wherever identification and authentication is a need, regardless of their type, size, shape or geographic location. Organizations where customer identification or authentication is not a part of core functions; this technology can be implemented for other application like door access, employee identification and attendance, etc. Wherever customer identification is a part of core activities, like in banking services, financial service industries, healthcare and telecom; biometrics dramatically reduces time consumed in customer / member / patient identification or identity verification. As more and more organizations and institutions choose to streamline its customer identification process, only biometrics seems offer a viable solution. Banking and financial services is the industry that incessantly leverage technology to protect customers from financial fraud and identity theft. According to a survey performed in 2015 by Mobey Forum, a global industry association empowering banks and other financial institutions to lead the future of digital services, revealed that banks and financial institutions, which have not yet leveraged biometrics for customer identification, are considering it to secure their customer identification and authentication practices. The survey also revealed that financial service industry is more inclined towards fingerprint and voice recognition (31% and 14% respectively) than other biometric modalities. 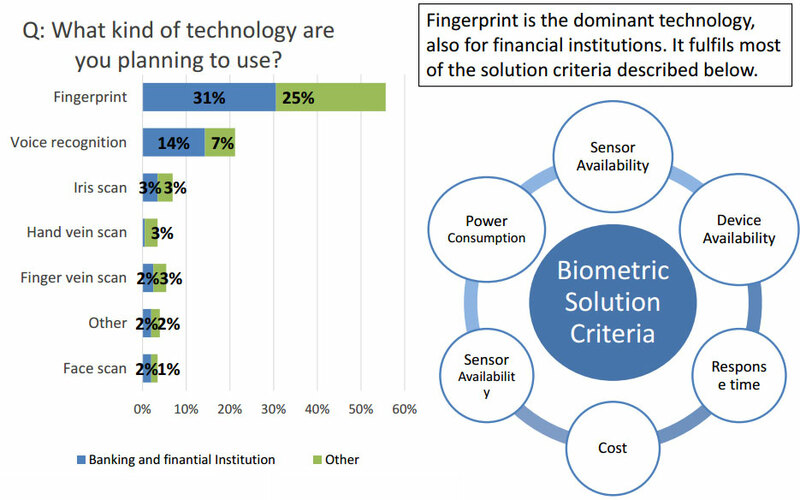 The survey also revealed that inclination towards fingerprint recognition is not limited to banks, other sectors are also looking at fingerprint recognition to streamline their identification or verification practices. Education sector have been using biometrics for a while but its full potential is yet to be leveraged. According to a report published by Research and Markets, the global biometrics market in the education sector alone will grow at a CAGR of 26.28% during the period 2017-2021. Biometric will also become a $11 billion market in Banking and Financial Services by 2020, securing $5.6 trillion payments, a report from Capgemini States. Usage of biometrics in military is also expected to grow. The global market for military biometrics accounted for US$ 5,650.5 million in 2016. The market is expected to grow steadily at a CAGR of 7.4% from 2017 to 2025, to reach US$ 10,620.6 million, as per the report from TMR. 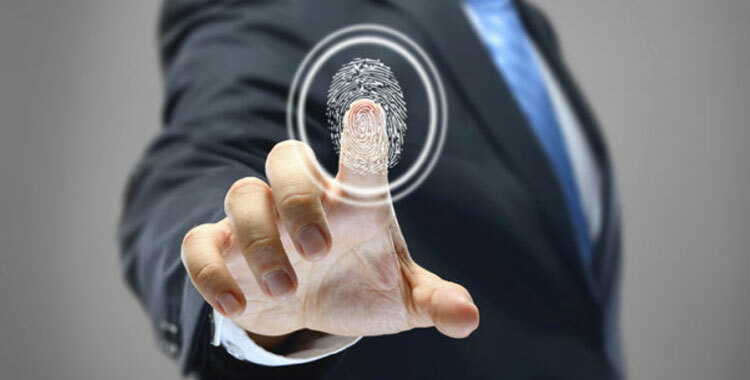 While different biometric modalities have their own set of advantages and disadvantages to offer, fingerprint recognition has been a favourite method of biometric recognition among businesses, researchers and consumers. It is cheap to implement and easy to use, and these characteristics have made it the most successful biometrics over time. This trend seems to continue in the future as well. According to Technavio’s market research, the global fingerprint biometrics market will grow at a CAGR of close to 12% during the forecast period. The report identifies major players in the market and presents a comprehensive analysis by end-user (Healthcare, Govt., Retail, BFSI, Transit and others); by technology (AFIS technology and Non-AFIS technology) and by Geography (North America, Europe, South America, Middle East and Africa, and Asia Pacific). 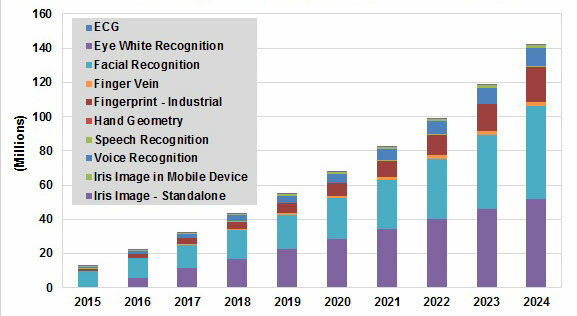 Market intelligence firm Tractica forecasts that the biometric modalities representing the largest revenue segments will be fingerprint recognition, voice recognition, iris recognition, and facial recognition. Meanwhile, the largest application markets for the technologies will be consumer, finance, healthcare, government, and enterprise. The market intelligence firm Research and Markets forecasts that annual biometrics hardware and software revenue will grow from $2.4 billion in 2016 to $15.1 billion worldwide by 2025, representing a compound annual growth rate (CAGR) of 22.9%, this report predicts that cumulative biometrics revenue will total $69.8 billion. Adoption of biometric systems did not remain limited to a specific region or market. Biometric devices and use cases have been implemented across nations by government as well as private organizations, regardless of political or economic structure, size and geography. Global adoption gave biometrics the required push to become a mainstream identification method. Once limited to forensics and law enforcement, biometrics has now made it to smartphones, computing and mobile devices. Now people instantly authenticate their identity several times a day when they unlock their smartphones or authenticate a mobile payment on a banking app. This instant authentication takes place without the need of understanding its technical aspects. Adoption trend of biometrics is indeed overwhelming but it does not stop there. 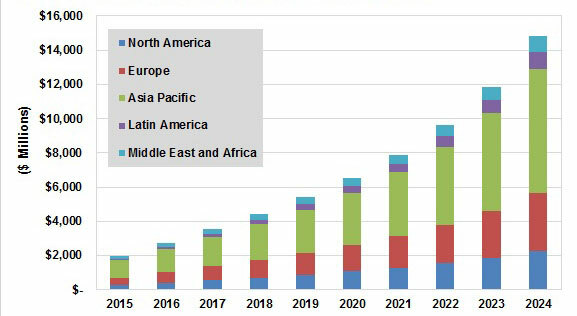 Market intelligence firm Tractica forecasts that the global biometrics market will increase from $2.0 billion in 2015 to $14.9 billion by 2024, with a compound annual growth rate (CAGR) of 25.3% and cumulative revenue for the 10-year period totalling $67.8 billion. The firm also estimates that global enterprise biometrics revenue will reach $1.7 billion by 2024, with cumulative revenue for the 10-year period totalling $7.9 billion at a compound annual growth rate (CAGR) of 28%. This will further intensify the competition and slash prices, owing to the huge market it is going to have in future. Governments, business and institutions across the world have chosen biometrics as their primary identification method for various applications. Mass production induced by increasing adoption has dramatically cut down prices of biometric recognition systems, sensors, and spares. Increasing numbers of implementation made mass production of biometric systems imperative and slashed prices. A biometric system’s price may depend on factors like brand, certifications, waterproofing, type of sensor, etc. A small USB fingerprint scanner can cost as little as $50 and a sophisticated ten finger scanner with live finger detection ability can cost $2500 as well. Increasing production and completion are expected to lower the prices further. Average selling price of global mobile fingerprint sensor volumes is estimated to be dropped to $2 per unit in 2020 which was as high as $5.5 in 2014. Use of fingerprint scanners rose steeply during 2010s. Consumer electronics, specially mobile phones and tablets made extensive use of fingerprint sensors. The chart above shows how revenue and order inflow skyrocketed for Fingerprint Cards from Q3 (2014) to Q4 (2015). Newer trends like cloud biometrics is set to take the biometric affordability to the next level. According to an estimate by Frost and Sullivan, market revenue for fingerprint authentication on mobile devices is to increase from US$52.6 million in 2013 to US$396 million in 2019. Biometric technology powered authentication is changing the way people are identified or their identities are verified. Biometrics has completely replaced traditional identification methods in many sectors across the industries. Since people and organizations follow what other successful entities are doing, it has induced a chain reaction of implementation of biometric applications. This widespread adoption has slashed prices of biometric hardware and software, and opened a huge global market which is yet to be fully leveraged. Mobile biometrics has recently become popular among manufacturers and customers alike and going to benefit whole biometric eco-system. As technology further penetrates the every possible aspect of personal and social life, demand of applications and devices is set to increase. Many service providers have integrated their smartphone applications with built-in biometric hardware for customer authentication to access services. Fingerprint sensor is the most prominent biometrics hardware used on most smartphones, however, with the launch of devices like Samsung Galaxy S8, which uses iris recognition and Apple’s iPhone X, which leverages face biometrics, other biometric modalities are expected to witness growth as well.